Hill's i/d has been carefully formulated to be particularly easy to digest. It is very suitable for many disorders associated with symptoms of poor digestion. It can be prescribed by vets for particular medical conditions, but is frequently used simply for individuals which are prone to intermittent vomiting or diarrhoea. 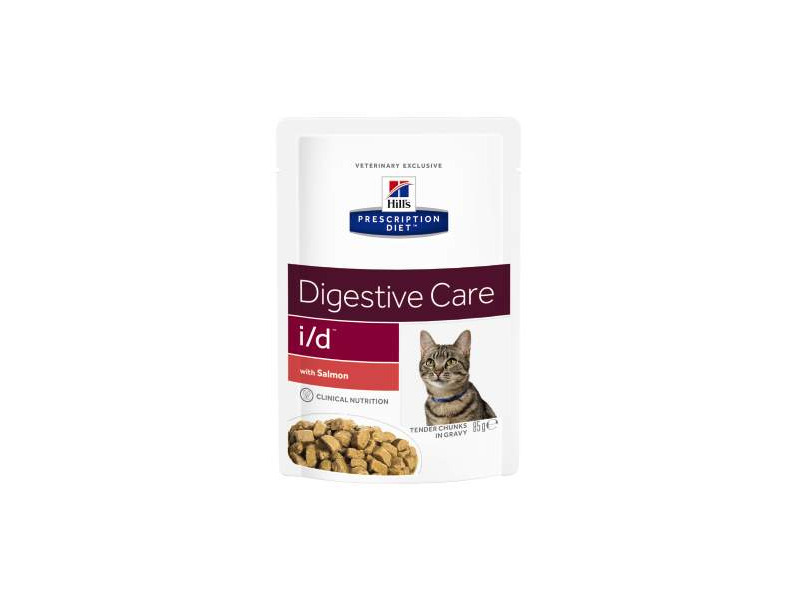 Hill's i/d is sometimes used when no specific underlying problem can be identified, but symptoms of poor digestion persist. In these cases Hills i/d might be used and if symptoms are controlled, it can be used indefinitely. An 85g can is equal to 20 grams of the dry food and a 156g can to 40 grams. Digestibility High Improves availability of nutrients, whilst allowing for recovery of the digestive tract. Texture (canned) Non-irritant pate Helps limits vomiting by soothing gastric mucosa. Fat Controlled Helps limit vomiting, by encouraging stomach emptying, and steatorrhoea. Soluble fibre Supplemented Provides short chain fatty acids to nourish enterocytes in the colon and restore intestinal flora. ×Pre-biotec carbohydrate (pouches) Supplemented Contributes to a healthy digestion. B-complex vitamins Increased Helps reduce losses due to vomiting and diarrhoea. Ingredients: Chicken: Chicken (37%) and turkey meal, maize, brewers' rice, animal fat, maize gluten meal, dried whole egg, minerals, digest, dried beet pulp, cellulose, fructo-oligosaccharides, psyllium, vitamins, taurine, trace elements and beta-carotene. With a natural antioxidant (mixed tocopherols). Ingredients (Can): Chicken: Pork liver, chicken (18%), rice flour, potato protein extract, animal fat, minerals, cellulose, dried beet pulp, taurine, vitamins, psyllium and trace elements. Chicken (27%): Chicken, pork, tapioca starch, salmon, wheat flour, vegetable protein concentrate, maize starch, glucose, cellulose, calcium sulphate, protein meal, yeast, potassium chloride, sunflower oil, trace elements, vitamins, caramel and magnesium oxide. Provides complete balanced nutrition for growing kittens as well as adult cats. 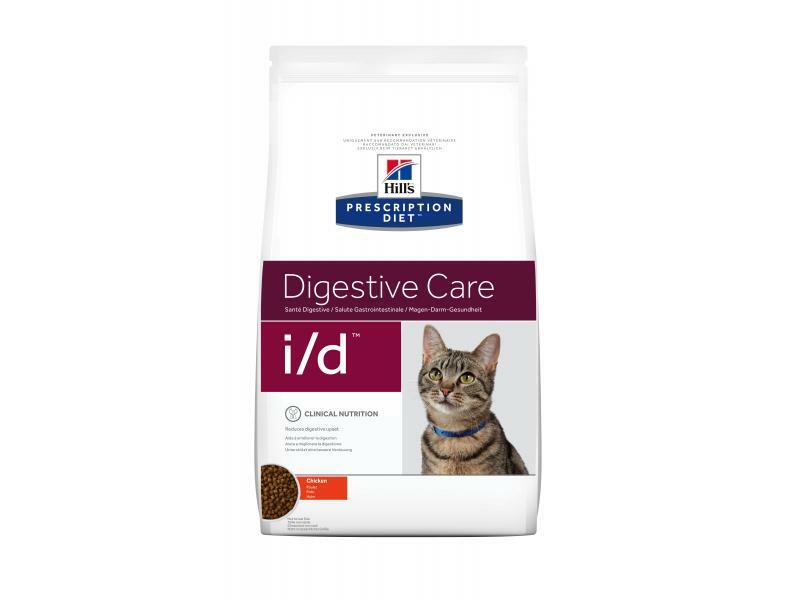 Below are some recent questions we've received regarding Hill's Prescription Diet i/d Digestive Care Cat Food, including answers from our team. My cat has developed pancreatitis do you have a wet and dry type food suitable for him please? 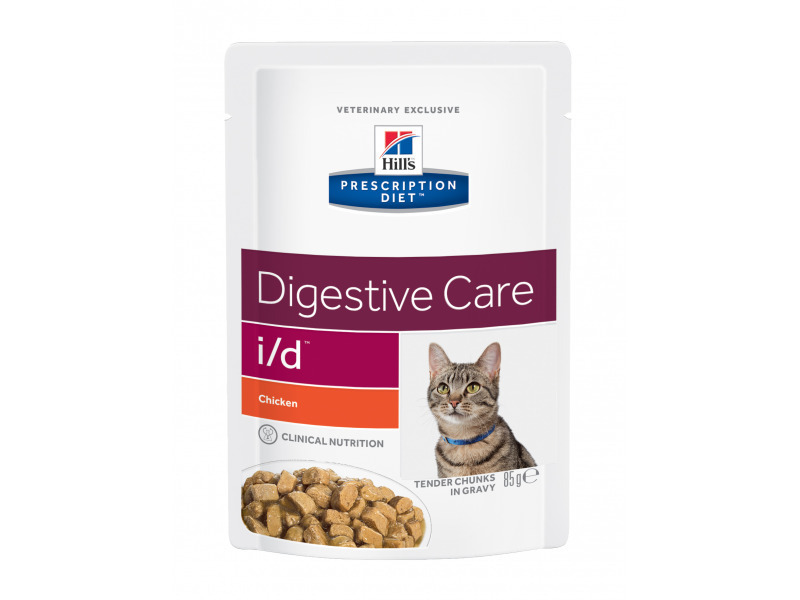 Hills Feline i/d is usually suitable for feline pancreatitis. 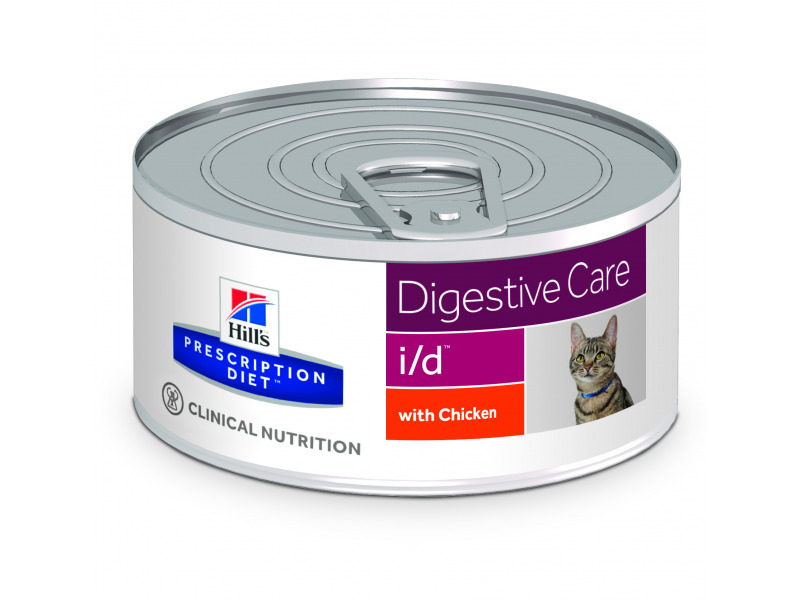 It is available chicken flavour in both dry and canned versions, as well as a salmon flavour wet food in pouches. The dried version should be fine to use as long as your cat has free access to plenty of fresh water and appears bright and perky. If your cat appears unwell at the moment in any way, then your own vet is better able to advise you on what to give. My cat has been on the urinary prescription diet for many years due to cystitis and crystals, he now has pancreatitis & the vet said he must go on to Royal Canin Gastrointestinal Moderate calorie food which would be suitable for both conditions. Unfortunately he doesn't like this so I am searching for an alternative food & wondered if this Hill's ID food would be suitable for both his conditions? The causes for some cases of cystitis, as well as crystal formation, are difficult to be sure about. I think therefore that it is impossible to be sure that the Hills i/d cat food will be suitable. However it will probably be OK, especially if you use the pouches, or maybe the cans. Cats are more likely to suffer from urinary disease if they are on dried food, due to the reduced water intake with their food. You should check with your vet, but I think that Hills i/d is likely to be suitable for your cat now.